After 10 years of talking myself out of laser eye surgery, I did my PRK laser eye surgery blended vision on November 28, 2017. Having an Astigmatism in both my eyes, at one time I would not have qualified for laser eye surgery and was convinced that I would not quality when I entered the local office in November 2017. After all, my eyesight was really bad; my left eye being -6.0. 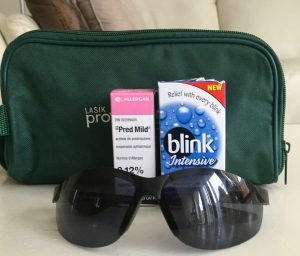 When I entered the clinic, I was aware that even with eye surgery I could still need glasses but I was prepared to go ahead anyway. After reading several good reviews about my doctor, I anticipated that there would be a wait time in his office for the surgery. Knowing this I brought my office to the clinic to keep occupied. Since I would need to take some time off my employment, I would work ahead. I sat on a long couch in a private area of the waiting room with my computer, cell phone and overdue office work. Unfortunately, there was no wait. I was called within 15 minutes of being there. I was taken into a prep room in which I was given Valium to relax me. Once I entered the surgery room I was given a blanket because it was cold and I had to lie on my back. Freezing drops were placed in my eyes. I felt like I had entered a car wash. Water was constantly sprayed in my eyes, and then a polishing tool was used on one eye at a time. They propped open one eye at a time with a clamp so that it remained open during the procedure. As the laser approached I was told to look at the laser, at the red dot, and not to move my eyes. The whole procedure was pretty fast. Two contact lenses were placed in both eyes, these lenses were used as a bandage protecting both eyes while they healed. The doctor asked to see me within 24 hours of the surgery. My eyes were very sore but my vision was 20/20. I sat in the waiting room with all the blinds down. I had to take multiple eye drops 4 times a day at the start. I felt like a vampire, the sun hurt even with my polarized glasses on. The doctor told me that my eyes would not stay 20/20 they would get blurry within the next few days. It was important that I do not strain my eyes, avoid the computer and the TV. This was not hard to do because my eyes made them blurry. The contact lens or bandage that was placed in both of my eyes was removed. This contact lens caused a scratchy sensation in my eye, as it slowly got old. I found comfort in taking my painkillers so that I would not accidentally scratch my eyes. The painkillers lasted up to day 5. I was told to not rub my eyes for this would make things worse. I had to stay away from water, I could have a shower but I had to wear goggles so that any water would not go into my eyes. through happened, I was told I could drive. My vision was not yet 20/20, but it was a lot better. I wondered if eventually I would need a prescription for glasses. To give my eyes a further break I continued to be driven around, but I started to watch TV and use the computer. I also returned to work on week three. The problem was that everyone heals at their own rate, so be prepared for this when taking time off work. At the two-month mark, I still cannot drive at night. My eyes are still sensitive to the light. Slowly the blurriness is starting to fade everyday. I feel that a miracle has happened. I wake up each morning and reach for my glasses, realizing presently I do not need them. My eyesight is not yet 20/20. I am very close, my eyesight being 20/25. My eyes are now less dry and I have now been given a letter stating that I can drive without glasses. One eye is above 20/20, The other stayed at 20/25. I was told to keep my blended vision the right eye should never be 20/20. If this happens I would not be able to see close up just far away. There are some side effects. My vision at night is still blurry; I see ghosting when I look at the lights. Putting a light perscription sunglasses on while I drive at night seems to help with this. My eyes are much dryer then before the surgery. Hopefully with time this will change. Prepare for the fact that you may need to take up to three weeks off work. Do only one eye at a time if you have to return to work earlier. At first you will not be able to read, drive or watch TV. Download audio books; listen to YouTube videos, podcasts and music to keep yourself busy. Find a friend who is willing to drive you to your appointments before you book your surgery appointment. Make sure you own a pair of polarized glasses and goggles so that you can avoid strong light and water. Don’t be afraid to take painkillers after the surgery. Your eyes will itch and you will feel pain, the most important thing is you will need to avoid rubbing them. Painkillers can help with this. Remember everyone heals at a different pace. It is out of your control. Do not go for the cheapest price when choosing your provider. My clinic was more expensive but they paid for the eye drops and had a warranty included. You could need a revision, so I would recommend that you purchase a warranty if the clinic provides one.